Back in 2015, Governor Snyder and the Michigan legislature eliminated taxation of personal property for most small businesses. Specifically, those with personal property with less than $80,000 value, according to the state’s assessment guidelines. Basically, depreciated book value. However, to obtain the exemption, Michigan small businesses had to file an affidavit of exemption by mid-February of each year. One of our teams’ early tax season projects every year was preparing the affidavits for clients to file. If it didn’t get filed, the city or township could assess the tax. The whole process of preparing and filing the affidavit was time-consuming and not appreciated by business owners, their CPAs and city and township officials. 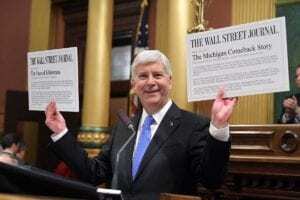 This past year, proving that they occasionally do listen to their constituents, the Michigan legislature passed a new law making filing the affidavit a one-time request for permanent exemption. The next (2019) affidavit of exemption will establish a permanent exemption. Under the new rules, you will be exempt until the exemption is rescinded. And….the forms are now available. At DeHoek & Company, we have started preparing them and will be sending them out in the near future. Our clients should see them in their mailboxes in the next couple of weeks.